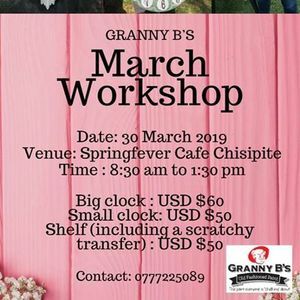 Granny B Chalk Paints in Zimbabwe in association with Thrifty Vintage offer you a creative Saturday morning at Spring Fever in Chisipite, Harare. All you need is to book, pay and come along and enjoy being creative with the talented Marie Erlank. For those that want to learn how do make wonders with Chalk paint, decoupage, transfers, embossing and stenciling nows your chance, join us at the March Granny B workshop.